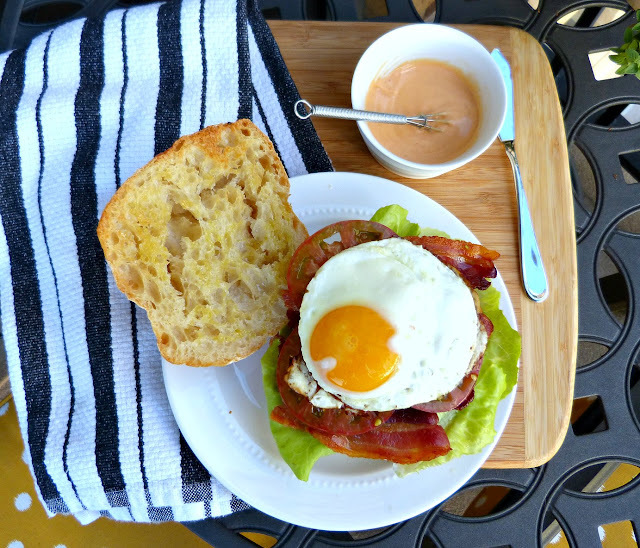 Fall may be here, but if you're still soaking up the last few drops of summer then this recipe is for you-- it's the perfect way to enjoy the flavors of summer produce and the grill in one easy delicious meal! I find that people fall into one of two camps when it comes to the end of summer: Either you can't wait for the start of crisp sweater weather and the end of sticky 90 degree days or you're mourning the end of beach days and the return of hats and scarves. I am most certainly in that former group. I LOVE fall and can't get enough of wearing layers, crunching leaves, and pumpkin-flavored everything. That said, we have been experiencing a bit of an Indian Summer these days and while I'm not loving the lingering heat, I am enjoying the warm nights that are perfect for dinner on the grill. 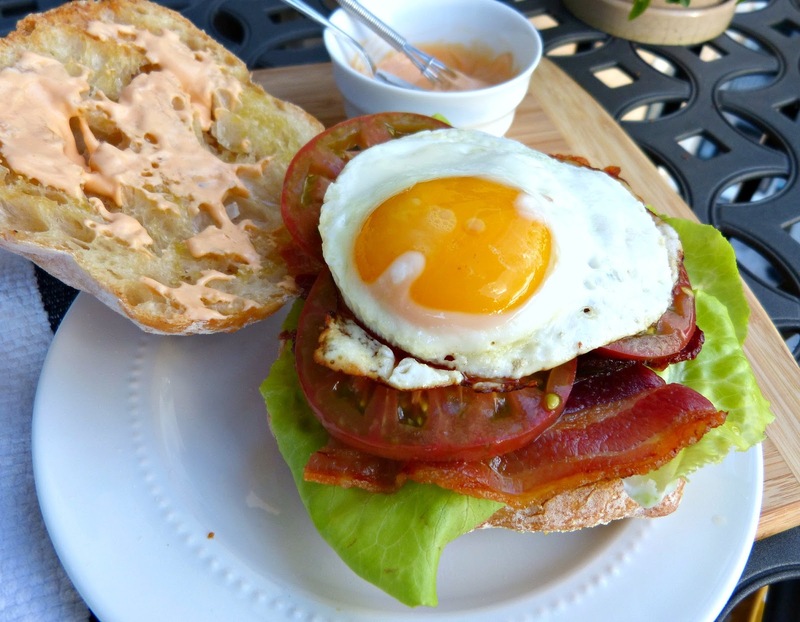 And this recipe in particular fits the bill-- not only is it super fast and easy, but it has all of the light and fresh flavors of summertime. Because corn is in season for such a seemingly short amount of time, I love to cook with it as often as possible during the summer-- especially on the grill. 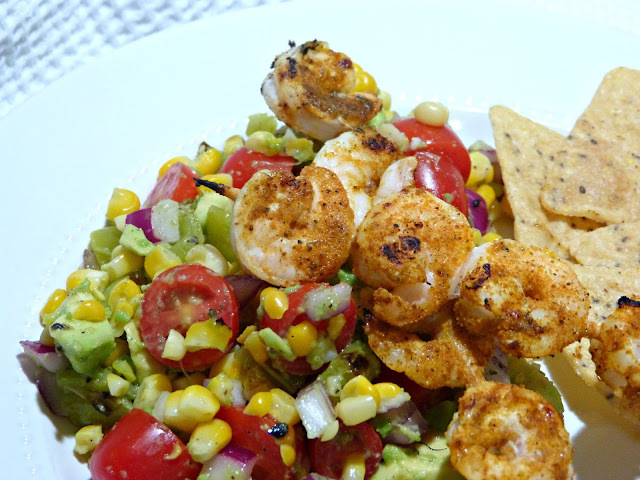 Grilled corn right off the cob is the base of this delicious southwestern-inspired salad, filled with sweet tomatoes, bright red onion, creamy avocado, and slightly spicy poblano that has a great smoky flavor from its own time on the grill. 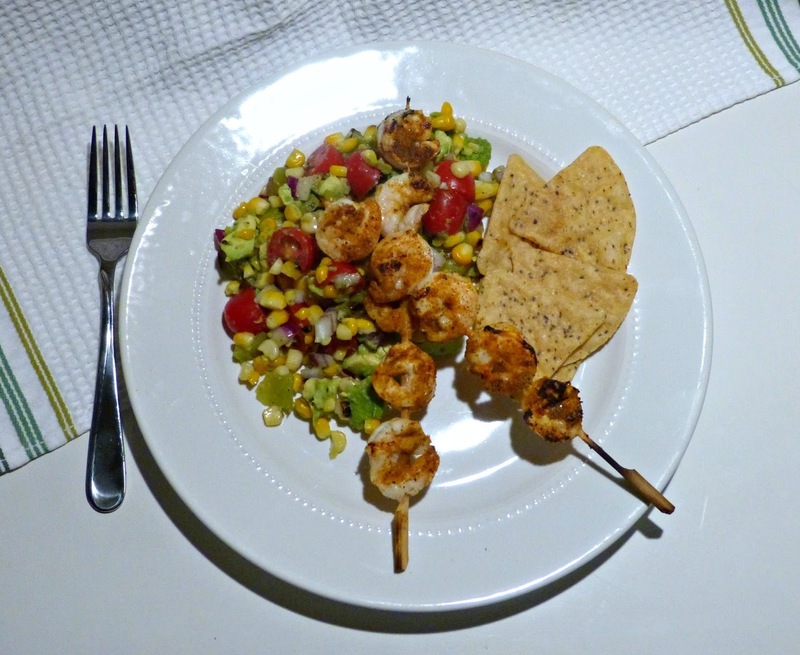 It's all topped by the easiest quick marinade for prepared shrimp: A combo of lime juice, Old Bay, and Adobe & Sazon seasonings lend bright full flavor to the shrimp. And they only take a few minutes to grill so dinner is done in a flash. 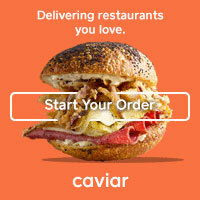 Want dinner even faster? The Whole Foods fish counter was running a great deal the day I was there buying shrimp for this dish-- the shrimp was already peeled, deveined, with tails removed on prepared wooden skewers. Just marinate, grill, and enjoy! In a large glass bowl, whisk together olive oil, 1/2 of the lime juice, Old Bay, Adobe & Sazo, and black pepper, to taste. Add in the shrimp and toss to coat. Cover the bowl and refrigerate for 30 minutes to 1 hour. Preheat the grill to medium heat. Cut the poblano pepper in half and remove the membranes and seeds from the inside. Spray the corn and pepper halves evenly with olive oil or cooking spray and season with salt and pepper. Grill the corn and pepper until softened and grill marks appear, turning to make sure they grill evenly. Remove from heat and allow the vegetables to cool enough to handle. Cut the corn off the cobs and discard cobs. Chop the peppers into 1/2 inch pieces. Add the cut corn and chopped poblano to a large bowl. Next, add the tomatoes, avocado, and red onion. Pour remaining half of lime juice over the vegetables, season with salt and pepper, and toss gently to combine the ingredients. Increase the grill heat to high. Thread shrimp on to prepared skewers and grill for roughly 2 minutes per side, until shrimp is pink and curled. Remove from heat and when cool enough to handle, pull shrimp off the skewers and if they still have tails, remove them. Serve warm shrimp with the corn salad and enjoy. Fall may (unofficially) be here, but it's still warm in Chicago so let's savor the last of the summer weather before it starts snowing, shall we? And what better way to beat (and even enjoy) the heat than with a frosty cocktail? I'm partnering with Lindy's Homemade Italian Ice today to bring you an easy recipe for an adults-only float! 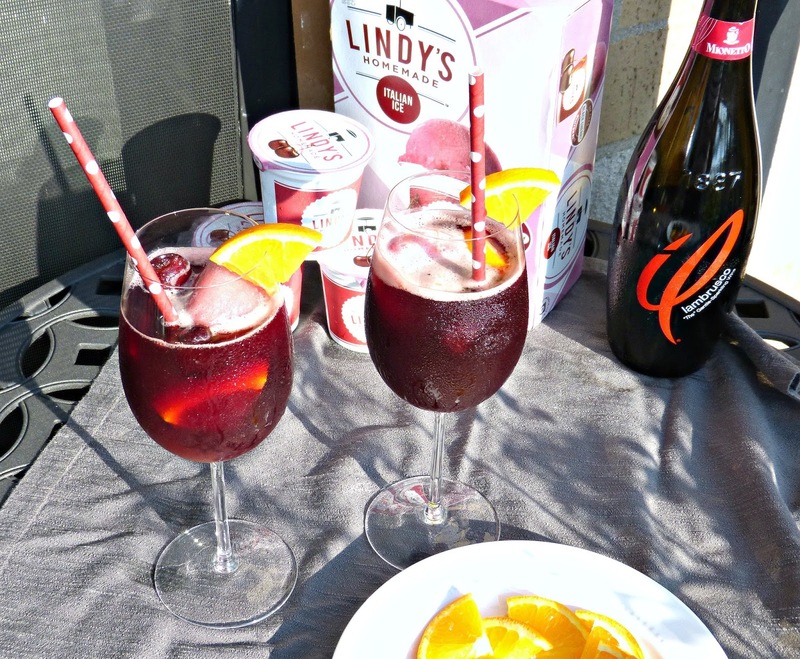 When I mentioned to my husband that I wanted to make a cocktail using Lindy's Italian Ice, I started throwing out a few ingredient ideas like prosecco or limoncello and he immediately said "lambrusco!" Alex isn't much of a wine drinker, but he does love Lambrusco, a northern Italian red wine that is unique in that it's sparkling and served chilled. And once he mentioned it, it seemed like the perfect wine to pair with Italian ice for a boozy float! 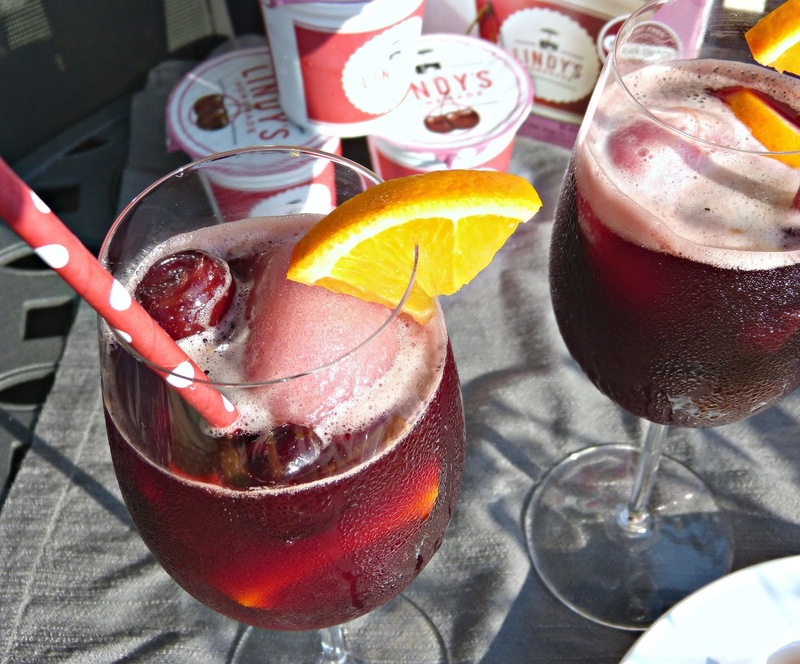 Lindy's Italian Ice is available in 11 different flavors so it was tough to choose which variety to use in this drink, but I ultimately selected black cherry because I thought it's deep flavor would pair really nicely with the flavor of red wine. The recipe is about as simple as that: add of scoop of black cherry Italian ice to a large wine glass along with a few frozen cherries and orange slices and then float it with a healthy amount of Lambrusco and a splash each of club soda and orange juice. The orange juice adds a bright citrus note to the richness of the cherry and red wine flavors. And the sparkling wine and bubbly club soda fizz up around the Italian ice, slowly melting it into the rest of the drink as you sip... like you'd want from any good float! These floats are the perfect cocktails to enjoy while we transition from summer to fall: frosty to keep you cool on these last few hot days, but with the rich flavors of red wine, black cherry, and orange, which feel fall weather-appropriate. As the weather gets cooler, you could even throw in a cinnamon stick or two and turn these into holiday-ready floats. 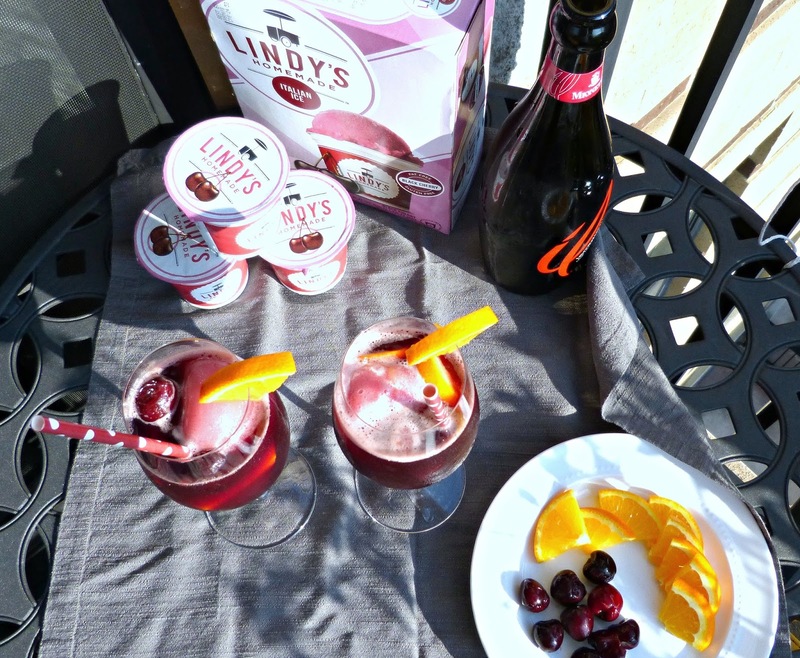 So, grab a box of Lindy's and a bottle of Lambrusco and toast to the remainder of summer! Remove one Lindy's Italian Ice cup from the freezer and gently squeeze the Italian ice out of the cup onto a cutting board. Slice the Italian ice in half and place one half in a large wine glass. Add cherries and 3 of the orange slices to the glass. 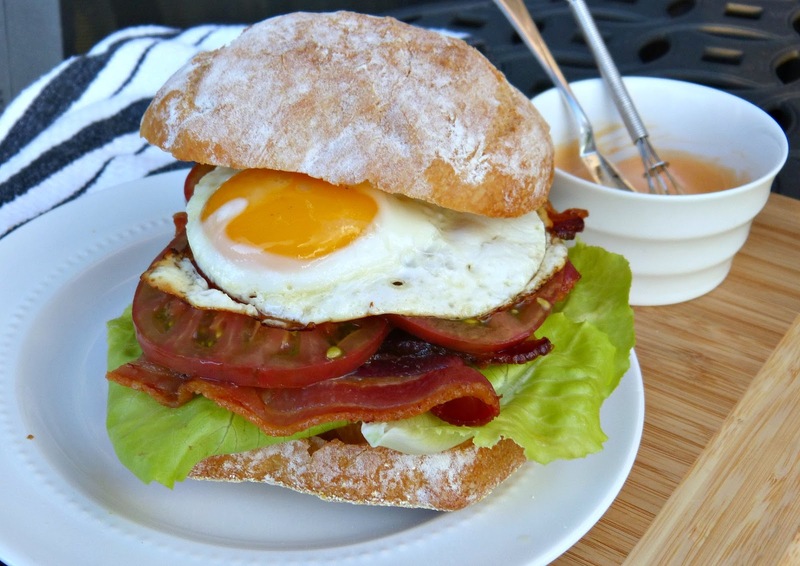 Top with orange juice, club soda and Lambrusco. Garnish with remaining orange slice and serve. Editor's Note: Complimentary products were provided in order to facilitate this post. All opinions expressed herein are my own.